Per the 1962 Missal, today's Feast is that of St. Ignatius of Antioch, but St. Brigid, though not celebrated liturgically by those using the 1962 Missal, is still honored today, especially among the Irish. St. Brigid -- her name is correctly pronounced "Brigg-id" or "Bree-id" but almost never is -- was born in A.D. 451 or 452 to a pagan father (Dubthach) and Christian slave mother (Broicsech) just after the time that St. Patrick was preaching (St. Patrick died in A.D. 493). It is said a Bishop -- a follower of St. Patrick -- met the pregnant slave woman and predicted that the child she was carrying would do great things. It is said, too, that a Druid of Dubthach's household had predicted that there would soon be born one who "shall be called from her great virtues the truly pious brigid; she will be another Mary, mother of the great Lord." Brigid's mother was sent away at the insistence of her father's wife -- sold to a Druidic poet in Connacht -- but Brigid was to be returned to her father after she was raised (it was undoubtedly he who gave her her name -- most likely in honor of the false goddess, Brigid, whose name means "Fiery Arrow" and who was akin to the Roman goddess Minerva, who concerned herself with fertility, prosperity, and poetry, and who was symbolized by a spear, crown, and globe). Her impoverished, enslaved mother did her best to raise her well, and a white red-eared cow is said to have provided all the food St. Brigid needed to grow, indicating that she was special indeed as white red-eared cows are rare in Ireland. When she was around 10 or so, she did move back to be with her father at Faughart Hill. She was given charge of the dairy -- but gave much of the produce away. This enraged her father, but she was strong-willed and continued in her charity. While still young, Brigid went to visit a Christian mission. The Bishop there was recounting a dream he had in which he saw Our Lady, and as he spoke, Brigid entered the room. He stopped and said that she was the one he'd seen in his vision -- another sign of the special graces she'd been given. Not too long later, Brigid returned to her mother and found her working hard in a dairy. Brigid stayed on to help her mother, leaving the relative luxury of her father's house out of love for her mother. She continued her charity, of course, churning butter in 13 portions in honor of Christ and the Apostles -- one portion larger than the rest which she'd give to the poor. Despite her giving away much of the produce, her pantry was always full -- miraculously so. This miracle and Brigid's charity changed the hearts of the Druid who'd bought her mother, and he and his wife converted to the Faith and gave Brigid's mother her freedom, whereupon she and Brigid returned to the land of Brigid's pagan father. Brigid was hated by her father's wife, and her charity wasn't pleasing to her father, either, as she gave away some of his wealth, so her father took her to live as a bond maid with Dunlang, King of Leinster, a Christian. When they arrived, Dubthach went in to speak with the King, leaving Brigid in the chariot. A leper came to her, and she gave him her father's sword so he'd have something of value -- even as Dubthach was complaining to the King about how Brigid was always giving away his things. King Dunlang, after meeting and speaking with Brigid herself and seeing Christian greatness in her, convinced her father to give her her freedom, and then gave him his own sword to compensate for the one Brigid had given away. As a freewoman, she became a part of her father's clan, and being a part of the clan made her marriageable to the clansmen. They began to seek her out as she was beautiful, but she consecrated herself to Christ and wanted no part of marriage. It is said that she, like St. Rose of Lima was to do later, disfigured her face so that no man would even want to marry her. Her resolve convinced her father to allow her to take the veil, and she became the first nun in Ireland. Now, women consecrated themselves to Christ before then, but lived in private homes; Brigid formed the first religious community for women in Ireland. She and 7 companions met with St. Mel, Bishop, in Mag Teloch. On meeting the women, St. Mel "recognized" Brigid, saying that he was the one who'd made the prediction about her when she was still in her mother's womb. He gladly consecrated the women, and when he did, it is said that Brigid's self-disfigurement was healed and her beauty restored. Brigid and her sisters first set up a convent in Ardagh, but then moved to what is now known as Kildare, "The Church of the Oak," on land given to them by the good King of Leinster who'd convinced Brigid's father to grant her her freedom. The fantastical Irish legend told to children is that she was refused the land near the oak tree that she loved, so told the King she'd be happy to accept whatever land her mantle could cover. The King assented, but her mantle miraculously covered all of Curragh! Her convent grew, and she travelled to set up others all over Ireland and also a school of illumination and metallurgy. In those travels, she became known for her Christ-given ability to heal and wisdom. Bishops, priests, and chieftans sought her counsel, and she was so beloved that she became known as "The Mary of the Gaels." A common blessing became "Brigid and Mary be with you." When St. Brigid died an old woman in A.D. 525 , her sisters kept a fire burning in an enclosure at her Kildare convent. This fire burned for centuries, tended by the Sisters and not burning out until A.D. 1220. It was re-lit and burned for 400 years, when the effects of the Protestant "Reformation" extinguished it again. St. Brigid's association with fire and the proximity of her Feast to Candlemas tomorrow -- a day celebrating Christ as the Light Unto the Nations, make the two Feasts entwined in the Irish imagination. On the day following Candlemas, the Feast of St. Blaise with its blessing of the throats with two crossed candles make for three days associated with light and fire. St. Brigid (she is often affectionately known as "Bride," "Bridey," or "the Mary of the Gael") is the patroness of dairy maids, infants, midwives, blacksmiths, poets, nuns, and students. Along with SS. Patrick and Columba (Columcille), she is the patroness of Ireland. St. Brigid is depicted in art as a nun with a Cross woven from rushes (see below), with a crozier, with fire (a candle, lamp, or bowl of fire), and/or with a cow. During one of her travels, St. Brigid went to visit a dying pagan chieftan. As she sat near his bed, she picked up some rushes on the floor and began weaving a Cross. He asked her about what she was doing and, in explaining, she told him about Christ and the meaning of the Cross. He came to faith and was baptized. May the blessing of God, Father, Son and Holy Ghost be on this Cross and on the place where it hangs and on everyone who looks on it. It is then hung on the front doors of homes and left in place all year, to be burned and replaced with a newly-woven Cross on the next St. Brigid's Day. 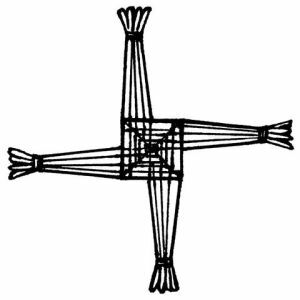 Click here for instructions on how to make a St. Brigid's Cross. It is said St. Brigid comes to visit on her Feast Day, blessing people and livestock, bringing her white, red-eared cow with her. To welcome her, families leave an oaten cake and butter on the windowsill -- and corn for her cow. Families also hang a ribbon or handkerchief out on trees or clotheslines, believing that if the Saint touched it it would have curative powers. These ribbons or handkerchiefs are called "St. Brigid's Mantle." Because of St. Brigid's association with fire, the building of bonfires would be fitting, too, if you live in a temperate zone. Fire and light are the perfect segue into Candlemas tomorrow, too, a day known as a "Feast of Light." Simmer kale or cabbage in 2 cups water and oil for 10 minutes, then drain, and chop fine. Boil potatoes and water, and simmer 'til tender. Simmer the leeks in milk for ten minutes 'til tender. Drain and puree the potatoes. Add leeks and their milk and the cooked kale, and mix in. Add mace, salt and pepper. Mound on a plate and pour on the melted butter.Garnish with parsley. Drain, peel and mash the hot potatoes. Stir in the raw potatoes, flour and baking soda. Add salt and pepper to taste. Mix well with enough buttermilk to make a stiff batter. Shape into 3 inch patties about 1/4 inch thick and fry on hot greased griddle until crispy and golden on both sides. A day ahead, combine the oats and buttermilk in a small bowl. Blend thoroughly, cover and refrigerate overnight. The next day, preheat the oven to 350 degrees F. Remove the oat mixture from the refrigerator. Combine the bread flour, baking soda, baking powder, and salt in a large bowl. Slowly add the oat mixture and stir with a wooden spoon 20 to 30 times, or until you have a smooth dough. Grease a baking sheet with the oil spray. Turn the dough onto the baking sheet, and use your hands to form a round, cake-shaped loaf about 1-inch thick. Use a sharp knife or pizza cutter to cut the dough into 4 quarters. Move the quarters apart slightly, but keep them in the original round shape. Bake until the cakes are light golden brown and firm to the touch, 30 to 35 minutes. Cool slightly on a rack, and serve with butter and jam or preserves. Makes 1 loaf (in quarters).